Tommy Thompson did this last night. You read that right: only two players have scored more non-penalty goals in MLS this year than 22-year-old Gyasi Zardes of the LA Galaxy. Like Tommy Thompson and Wil Trapp, Zardes is a homegrown player, a product of MLS’s academy system. Given that, it’s surprising we don’t talk more about Zardes. Let’s change that. Both of these teams are attempting to recover from 3-0 losses in their last match. If Houston is to make the playoffs, they’re going to have to string together results starting soon. SKC, meanwhile, can return to the top of the Eastern Conference (albeit having played one more match than DC United) with a win. How low can United go? On Tuesday the Red Devils lost 4-0 to League One side MK Dons in a League Cup match. Their squad for a Premier League match at newly-promoted Burnley will likely be a bit more impressive. On the other side of Manchester, the champions are smiling after a 3-1 victory over Liverpool. City will expect to start the season with 9 points from 9. The Italian champions begin their Serie A campaign with a trip to Chievo, who finished 16th last season. The Toffees have started the season with a pair of 2-2 draws, and frankly their fans will have found both disappointing. Chelsea are one of the rare clubs that believe they can get 3 points from Goodison Park. Adding to the drama, Samuel Eto’o is expected to make his Everton debut against his old side. It’s the first big test of the season for Spurs, who impressed last week against lowly QPR. Liverpool won this fixture 5-0 last year, but this year’s side might not be on that level. Mario Balotelli is expected to make his Liverpool debut. Without Olivier Giroud, Arsenal have something of a question mark up top. Arsene Wenger has been fond of using Alexis Sanchez in the striker role, with mixed results at best. The Foxes got a draw with Everton in their first home match, and they’ll be hoping to spoil another big club on Sunday. In one of the rivalries that stretches back to MLS’s inaugural season, DC will be looking to bounce back from a Wednesday night loss against LA and maintain their lead in the Eastern Conference. New York can’t afford many slip ups, given that they hold the final playoff spot by just a single point over Philadelphia and New England. The San Jose Earthquakes are in eighth place in Major League Soccer’s Western Conference. With 11 games remaining in the season, it’s not inconceivable that they could erase the 8-point gap between them and the final playoff spot, but things are looking bleak. Their big summer signing, Matias Perez Garcia, scored in his debut, but has since undergone knee surgery. Having long ago exited the US Open Cup, 2014 is looking like a lost season for the Quakes. Sometimes, however, good things are discovered during lost seasons. Due in part to injuries, the Earthquakes have called on their first-ever homegrown player, Tommy Thompson. The son of Gregg Thompson, who made twelve appearances for the USMNT in the 1980s, Tommy played for the Earthquakes Academy before going to Indiana University, where he was the leading scorer his freshman year. He turned 19 on August 15th, and has gotten his first two MLS starts in San Jose’s last two games. It’s far too early to make bold predictions on his future, but from what he’s shown so far, the youngster is worth keeping an eye on. The New York Red Bulls entered Saturday night with a slim hold on the fifth and final playoff spot in the Eastern Conference. Just one point kept them above both the Philadelphia Union and New England Revolution. A home game against the last-place Montreal Impact seemed like a good opportunity for New York to at least maintain their hold on fifth. Despite creating several chances early on, the Red Bulls went into half trailing by a goal. After the break, 36-year-old Thierry Henry took over. What you’re about to see is a 25-minute clinic on putting the ball into dangerous territory. There’s not much I can add to these gifs, so I’ll keep my commentary limited. -The slow start continues for Manchester United, as Louis van Gaal’s side managed only a draw at Sunderland. Robin van Persie returned to action for the first time since the World Cup, but it was Juan Mata who scored the Red Devils’ lone goal. 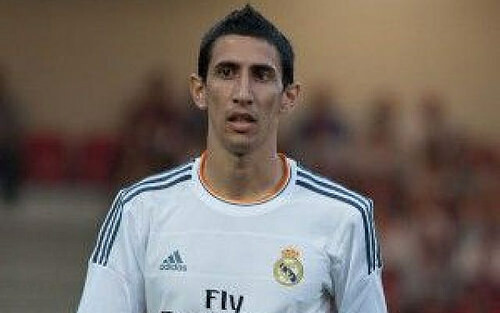 The good news for United is that they’re expected to sign Angel di Maria. The bad news is that he isn’t a defender, might not have a place in van Gaal’s system, and costs about as much as Diego Costa and Cesc Fabregas combined. -The most impressive performance of the weekend came from Tottenham, who demolished QPR—and former manager Harry Redknapp—4-0 on Sunday. QPR’s 3-man back line was constantly under assault in the first half, and Spurs broke through three times before the break. The third might have been the most impressive; Erik Lamela dragged the defense out of position, before hitting Nacer Chadli with a beautiful ball to culminate a 48-pass move.